Mong Kok, Hong Kong, Hong Kong. Neck-tongue syndrome (NTS) is a rarely reported disorder characterised by paroxysmal episodes of intense pain in the upper cervical or occipital areas associated with ipsilateral hemiglossal dysaesthesia brought about by sudden neck movement. The most likely cause of this clinical entity is a temporary subluxation of the lateral atlantoaxial joint with impaction of the C2 ventral ramus against the articular processes on head rotation. NTS is an under-recognised condition that can be debilitating for patients and challenging for the treating physicians. Here, we report a 47-year-old man who fulfilled the International Classification of Headache Disorders, third edition criteria for a diagnosis of NTS was treated successfully with a chiropractic approach. There are currently no consensus guidelines for dealing with this disorder. Reassuringly, chiropractic care for uncomplicated NTS appears highly effective. (E) clinical features not better accounted for by another ICHD-3 diagnosis. Imaging is primarily used to search for secondary causes amenable to more aggressive medical treatment or surgical intervention. This presentation aims to shed some light on the understanding of this intriguing entity. A 47-year-old man sought chiropractic treatment for paroxysmal episodes of right hemicranial pain and tingling of the right face and ipsilateral hemitongue for 3 months. His trouble had begun with a dry cough and dysarthria which resolved spontaneously within 2 weeks. The patient described his headache as right suboccipital pain spreading across the anterior hemicranium to the periorbital and maxillary regions, with tingling of the right half of the tongue. The pains were brought out by an abrupt head turning to the right, forward neck glide or chewing. Symptoms usually lasted for minutes. He had no prior head and neck trauma, or systemic disorders. At first, the patient was examined by a neurologist. There was no elevation in white blood cell count, erythrocyte sedimentation rate and C reactive protein. Routine chemical parameters fell within normal ranges. Rheumatoid factor and antinuclear antibody were negative. His clinical features fulfilled the ICHD-3 criteria for a diagnosis of NTS. He had been on oral gabapentin and diclofenac which did not provide substantial pain relief. After a month or so, he stopped taking the analgesics because of unacceptable stomach upset. He ultimately came to chiropractic attention for the above complaints. ECPC: conceived and wrote the manuscript as main author. AFCL: critically reviewed and helped organise the manuscript. All authors: read and approved the final manuscript. Orrell RW , Marsden CD . Hu N , Dougherty C .
Gelfand AA , Johnson H , Lenaerts ME , et al . Neck-Tongue syndrome: A systematic review. Cassidy JD , Diakow PRP , De Korompay VL , et al . Maheshwari PK , Pandey A . The International Classification of Headache Disorders: 3rd edition. Smith H Kraemer J , Pal J , Bajwa ZH . In. Smith H , ed. Current Therapy in Pain. 1st edn. Sjaastad O , Bakketeig LS . Sidlow JS , Raden MJ , Sidlow R .
Neck-tongue syndrome: Viewpoints on etiology in a patient with bilateral symptoms. Webb J , March L , Tyndall A .
Cervicogenic headache: a review of diagnostic and treatment strategies. Waldman SD Waldman SD . In. Waldman SD , ed. Atlas of Uncommon Pain Syndrome. 3rd ed. 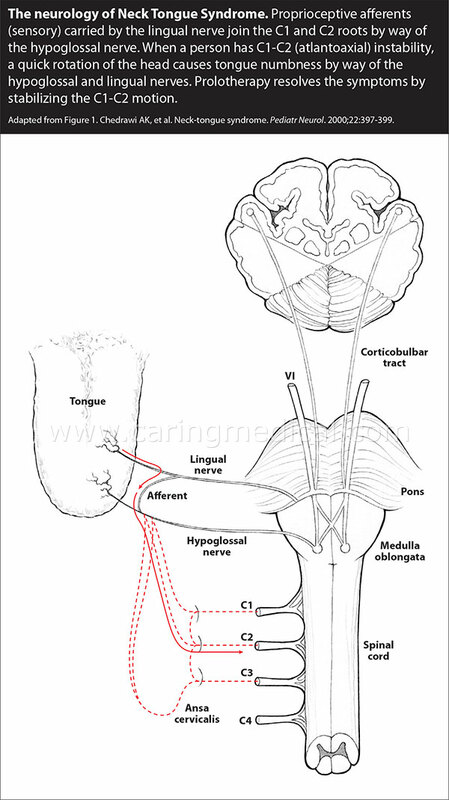 Occipital nerve blockage in cervicogenic headache: A case report and brief review of literature. Poletti CE , Sweet WH . clinical syndrome and surgical anatomy. Chedrawi AK , Fishman MA , Miller G .
Niethamer L , Myers R .
Elisevich K , Stratford J , Bray G , et al .